A visit to Haridwar is like stepping into a totally different world. Sprawling waters of Ganga, serene soft environment, enthralling mountains, saints performing prayers in Ashrams, all form a picturesque panorama. Several temples and ashrams spot this town. The main ghat at Haridwar is known as Hari ki-Pauri. It is known for a footprint of Vishnu on a stone in a wall. The five sacred bathing spots in Haridwar are Gangadwara, Kankhal, Nila Parvata, Bilwa Teertha and Kusavarta. The Ganga Aarti, which is celebrated each night at Hari-ki-Pauri, is a spectacular sight. Mansa Devi, Chandi Devi, Sapt Rishi, Maya Devi, Daksha Mahadev Temple, Daksha Mahadev Temple are the other religious sites of Haridwar. Rajaji Park in the vicinity of Haridwar is the destination for the wildlife and nature lovers. Sacred bath at Harki-Pauri : On the banks of Ganga, Har Ki Pauri is the major pilgrimage attraction in Uttaranchal. This sacred ghat is extremely important as footprints of Lord Vishnu are found in here. 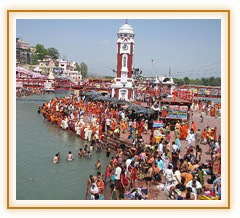 Har Ki Pauri is a famous ghat on the banks of the Ganges and the major landmark of the holy city of Haridwar. Literally, "Har" means "Lord Shiva", "ki" means "of" and "pauri" means "steps". Lord Shiva and Lord Vishnu are believed to have visited the Har ki Paudi in the Vedic times. Mansa Devi Temple : Mansa Devi Temple is a Hindu temple dedicated to goddess Mansa Devi in the holy city of Haridwar. 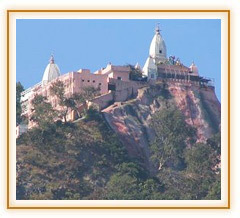 The temple is located on the Sivalik Hills, the southernmost mountain chain of the Himalayas. The temple is the holy abode of Manasa, a form of Shakti and is said to have emerged from the mind of the sage Kashyapa. Devotees who want their wishes to be fulfilled by Mansa tie threads to the branches of a tree located in the same temple. Once their wishes are fulfilled. Sivanand Ashram : Sivanand Ashram caters to the cultural needs of all ranks of people, to whatever class they may belong. The holy river Ganges flows by the side of the Ashram, coming down from Himalayas. Just as there is a Government in all countries to maintain law and order, there is also an inner Government to maintain law and order within ourselves. The Sivanand Ashram has the same belief and conteously working on making visitors believe in their spirituality. Ram Jhoola : Ram Jhula is an iron suspension bridge situated at Muni Ki Reti in Rishikesh. It is a connecting bridge between Swargadham, Gita Bhawan and other temples. Built in the 1980s, over the Ganges to cross the river and is also a landmark for city of Rishikesh. Ram jhula is located 3 kilometers north to Rishikesh where some of the Hindu ashrams and religious centers like The Gita Bhawan, and Swarg Ashram are located. Swarg Ashram : Swarg Ashram is a small township located 5 km away from Rishikesh, on the left bank of the Ganges. The ashram was built in the memory of Swami Vishudhanand. The township has many other ashrams, temples and caves, inhabited by saints, inside. Swargashram, which means Heavenly Adobe is a beautiful place situated in picturesque surroundings at the foot of Himalayas. The climate of the spots is splendid all the year. Geeta Ashram : Geeta Ashram is dedicated for the mythological awareness of the common people. Ashram encloses many paintings and statues of characters from Hindu Mythology. Ashram is neighbored by the banks of the holy river Ganges, a midst the Himalayan Mountains at Rishikesh. It consists of a very large complex. A large number of devotees visit and stay here for holy Ganges dip. During the summer months, day-long special programs are arranged for devotees. Laxman Jhoola : Lakshman Jhula is an iron suspension bridge situated in Rishikesh, Uttarakhand. 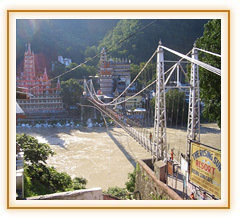 Made over river Ganges to cross the river, Lakshman Jhula is a landmark of Rishikesh near to Ram Jhula. It is believed that Lakshman crossed Ganges on jute ropes between the places where this bridge is built. Lakshman Jhula was built in 1939, offering spectacular views from the bridge. Many temples and ashrams around ends of the bridge attract visitors from different corners of India.